Powis Castle, sometimes also known as Powys Castle, is a medieval fortress and country mansion found in the county of Powys, in mid-Wales, not far from the town of Welshpool. Although most of the great medieval Welsh castles of the time were allowed to decay, Powis Castle is perfectly maintained and a great example of a medieval stronghold. The Castle, built around 1200, sits majestically atop a rocky ridge having quite a steep slope to the south-east, and was originally built as the fortress of the Welsh Princes of Powys. 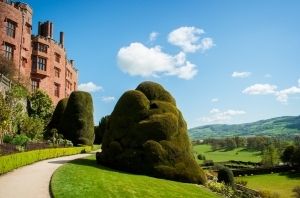 Also known as the ‘Red Castle’ due to its red grit-stone walls, Powis is a castle rich with over 700 years of history, being adorned with vast ornate gardens situated on different levels of ground. Powis Castle was built circa 1200 by the Welsh prince Gwenwynwyn ap Owain, who held onto his kingdom despite his more powerful neighbours in Gwynedd and England. Famous for its mild climate and fertile soil, in the 12th century Powys was known as ‘the paradise of Wales’. By the 13th century, Llywelyn ap Grufydd of Gwynedd had established himself as Prince of Wales, and he destroyed the original castle and forced Gwenwynwyn ab Owain into exile. Later on however, Lyywelyn’s power crumbled and it was Gwenwynwyn ap Owain’s son Grufydd ap Gwenwynwyn, also known as Grufydd of Powys, who regained his lordship and rebuilt Powis Castle under King Henry III. After 1255, Llywelyn ap Grufydd once again rose to power, Grufydd ap Gwenwynwyn once again fled, this time to England, after being embroiled in a plot to assassinate him. In 1277 however, he was given his lands back. 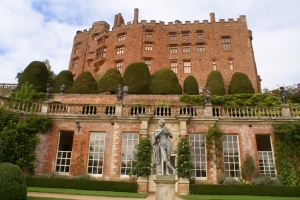 Powis Castle’s structural style is difficult to unravel, since there were continuous alterations and additions to it during over 700 years of occupation. Today, the Castle consists of an inner ward, surrounding a small courtyard, with an outer ward on the south-west, through which at present, visitors enter. The oldest part of the Castle is probably the tower at the north-east end of the inner ward. There is some curving masonry at the south end of the south-eastern wall which suggests that at some point there was another keep, possibly having the gateway forming part of the north-eastern tower. This hypothetical stronghold seems to have been demolished at some point, and replaced by a sub-rectangular structure, containing a hall on the north-western side, and possibly a second tower on the north-east. Later still, the south-west gateway was built, possibly after 1277. One can still see the outline of the original crenellations on the western tower, right below the existing 19th century ones, which are almost intact. The main surviving feature after the refurbishment of the Castle after the Restoration in 1660, is undoubtedly the grand staircase, as well as the state ballroom, which together with the gateway take up most of the range in the outer ward. The steps to the main south-west entrance were also added at this time, as were the first servants’ quarters which are to be found in the angle between the old hall and the northern end of the outer ward. George Herbert, the second Earl, carried out further extensive building around 1772, which can still be admired today. The ballroom in the outer ward, as well as the core of the present servants’ quarters were constructed, and other rooms were redecorated in a more fashionable classical style. Herbert’s sister married Clive of India’s son, and their heir was to inherit both of their fortunes. A collection of Clive mementoes from India is today on display in part of the old ballroom. These include priceless jade, ivory and bronze works, ancient armoury and textiles, including part of Sultan Tipu’s tent. Tipu Sultan was the ruler of the South Indian state of Mysore. This superb collection is well worth the visit as it features more than 300 items dating from the 17th to the 19th century. The many statues of Hindu gods and the ceremonial armour are especially impressive. Many of these were acquired by the Clives as spoils of war, after they aided the British to defeat the Turkish Sultan during an uprising. Within the mansion, the Long Gallery showcases the earliest interiors of the edifice, dating back to 1592. In the gallery one can admire the plasterwork ceiling, as well as various pieces of art. 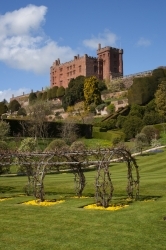 Apart from the museum and the mansion itself, Powis Castle is also very famous for its vast formal gardens. These consist of four long terraces with statues built into the rocky slopes just below the castle, and a large collection of huge clipped yew trees. For a time, until 2005, the estate also sported the tallest fir tree in Britain, a Douglas fir, 180 feet (55metres) high. The world-famous garden shelters rare and tender plants, each of them carefully labelled for the interested visitor. It was laid under the influence of Italian and French styles, and retains the original statues and orangery. On the flat land at the foot of the terraces, there is a fertile and beautiful lawn. The Kitchen Garden is also well-maintained, having a number of glasshouses, which provide thousands of plants reared purposefully for sale to visitors. The facilities are optimal, with a free vast car park directly next to the Castle, as well as a disabled car park close to the entrance. The large and airy café offers hot and cold drinks, as well as food. There are wonderful views all around, and a number of scenic walks and trails. Children can be easily amused with the ‘flower game’ which involves taking part in a quest to find items of interest and count the numbers of different species of flowers to get stickers at the end. Information about the opening times of the Castle, Museum and Garden respectively can be found on the official website, where there is an interactive calendar at https://www.nationaltrust.org.uk/ Mostly, the garden tends to be open from 11.00am to 5.30pm and the Castle and Museum open at 12.30pm till 4.30pm. Last admissions are accepted up to 45 minutes before closing time. Times may vary according to the seasons.